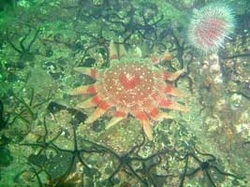 Sunstar and Brittlestars on the sea bed. At 3pm on Friday 1st July, Myself, Chris Butters, Trevor Jones and Ivon Richmond gathered on Seahouses harbour awaiting the arrival of our Dive Boat for the weekend, Gladtidings II. The rest of the group, Andy and Michelle Bannister and Rob King would not be joining us until later that evening due to other commitments. Our first dive was ‘The Hopper’ which is located on the South East side of Longstone and is basically a reef that drops from the surface to 20 meters. I became excited on arrival at the site as there were a number of seals in the water, sadly they had all disappeared by the time we had kitted up and entered the water. Seals aside, there was still plenty to see on the wall and seabed namely Dead-man’s Fingers, Brittlestars, Squat Lobsters and Shrimps. Toward the end of the dive Ivon led us into a canyon, on exiting this canyon I was convinced that I saw a seal swim past, however no-one is able to back me up! That evening the whole group met up for the first time for a bite to eat at a rather exclusive restaurant (we didn’t realise how exclusive until we were seated and presented with the menus). Although more pricey than intended, the food was a delight, but seeing as most of us were on a budget we unanimously agreed that fish and chips would be the order of the day on Saturday evening. After picking up the cylinders we had dropped off earlier to be filled, we all retired for the night as we needed to be on the harbour at 7am the next morning ready to go! Saturday didn’t quite start as planned, we all arrived at the harbour on time but were unable to park our cars as the barrier across the road leading to the piers was locked and the Skipper didn’t have a key. It was another 45 minutes before we had parked up and loaded ourselves and our equipment onto the boat. No sooner had we left the harbour for the dive site then we found ourselves returning as in the rush Andy had forgotten his dive computer! Who needs slack to dive a wreck? Dive 1 on Saturday was the ‘Chris Christensen’, a Danish steamer that sank in WW1 in 30m of water. As well as the usual boilers, propshaft and prop, we found a broken up steering wheel. Apparently this wheel appears on the front of the ‘Dive North East’ guide. Bottom time lapsed, it was time to ascend. Due to the different computers in use, I ended up doing an additional 10 minutes decompression at 6m, just as well their was a Worm Pipefish and plenty of small jellyfish around to amuse me and distract me from feeling the cold! Dive 2 was the ‘St Andre’, a 70m long vessel that sank in 1908 in 20m of water after hitting the Crumstone. I personally didn’t see much of this wreck as I was too busy watching (and trying un-successfully to photograph) Ivon and Rob hand feeding Wrasse but Andy and Michelle reported finding an Octopus under the boiler. My bad luck was still present once back onboard as a passing Puffin decided to present me with a present, charming! Saturdays diving was concluded at around 2pm which left us plenty of time to get in a round of crazy golf, the prize of which was a ride in a pink Barbie car at the local arcade – I am sure you can appreciate there was stiff competition. Afterwards, true to our word, we ate at a Fish and Chip shop then retired to a beer garden. We were all graced with a lie in on Sunday morning as we didn’t need to be at the harbour until 8am, which was just as well given the late night that some of the group had. After much discussion/ debate (with the other group of divers on the boat) it was decided that we would dive the ‘Acclivity’, a small intact tanker that sank on its port side in 30m of water in 1952 as opposed to the Somali. The conditions at the site were not ideal, there was noticeable swell meaning that not only would it be fun getting into the water and onto the shot, but getting out could potentially be problematic. After repositioning the shot for the rest of the group (it had been dragged off the wreck) we started our dive. The wreck itself is in very good condition and is literally covered in Plumrose Anenomies, there was barely a scrap of metal to be seen. You are able to penetrate the wreck in a number of places, which Rob and Ivon did, I opted to stay on the outside and take photographs, although much to Ivon's dismay I failed to realise he wanted a photo of himself on the prop and as he was on-top of it I missed it myself! As expected, the shot was no where in sight when the time came to ascend so a DSMB was deployed. Must admit, I personally find decompression stops easier on a shot line! For Dive 2 (and after re-fuelling en-route) we headed back to the shelter of the Outer Farne Islands, we were to dive the ‘Big Harker’. Due to the long surface interval between dives motivation was definitely required to get back into the water but I am glad I did. 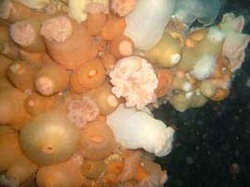 Big Harker was another wall dive the seabed of which was at 15m. Again there were plenty of photo opportunities and Rob also took the opportunity to conduct a weight test - much to my dismay I found myself with an extra 10lbs to carry! I now know how exhausted people must feel at the end of a dive if they are carrying too much weight. Overall a fantastic weekend was had by all, divers and partners alike, and I thoroughly recommend the Farne Islands to everyone. Admittedly my primary reason for diving the Farnes was to dive with seals but as there was so much else to see I was not disappointed at all. Puffin poo is removed from Jo in the traditional way. Diving: We used William Shiel (Seahouses), they have 2 boats used for diving. Be aware that the boat remains out all day and there is no compressor on board. Contact Details - http://www.farne-islands.com or 01665 720308. A number of places were used, from a Bunkhouse to B&Bs (although our starts were too early to warrant a fry up). Tackroom, Annasted Farm, Beadnell, Northumberland. Contact – 01665 720387. Price - £10 pppn. Rowena, 99 Main Street, Seahouses, Northumberland. Contact – 01665 721309. Price - £27.50 pppn. HorseShoe Cottage, 121 Main Street, Seahouses, Northumberland. Contact - 01665 721423. Price £23 pppn. Sovereign Diving Services, Broad Lane Industrial Estate, Seahouses, Northumberland. 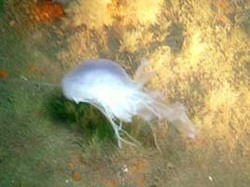 Contact Details – http://www.sovereigndiving.co.uk or 01665 720059. Price - £2.50 per air fill. You can park on the harbour for £3 (all day). The harbour supposedly opens at 6am and closes at 9:30pm.